On December 7, 1941 William “Bill” Temple was a 20 year old in the U.S. Air Force working in Pearl Harbor when he was surprised by the Japanese attacks. This week he returns to Hawaii for the first time since he left in 1945. Bill is here for the final Hawaii reunion of members of the Pearl Harbor Survivors Association. Membership in the organization, chartered by congress, is open to those who were on active duty in Pearl Harbor during the World War II attack. His youngest daughter Joan joined him on this visit. Bill decided to make the trip this year as it was important to him to attend this last reunion of the Pearl Harbor Survivors in Hawaii. One of the sights he looks forward to visiting on the trip is his old barracks at Wheeler Air Force Base. He was also stationed at Kualoa. Bill says, back in those days, he would walk out to Chinaman’s Hat. Bill’s mind is sharp as ever and he keeps up with news and politics. “The idiots in Washington better get God back into the country or they can kiss it goodbye. Republicans or Democrats – if they don’t have God in what they do, they are wasting their time.” he said. Bill lived in Virginia Beach his whole life. He was not impressed with his first visit to Waikiki Beach. I think he warmed up the the island of Oahu during his stay. When Bill was stationed in Hawaii, he took up surfing and body boarding and was pretty good at it. Not surprising as his teacher was Olympic medalist Duke Kahanamoku. After his tour In the service, Bill returned to Virgina Beach, married and raised a family. His diverse career included gas station owner, carpenter, electrical engineer and hospital employee. At 91 years young, he is state chairman of the Pearl Harbor Survivors Association and the group’s chaplin. A deeply religious man, Bill credits his long life and good health to God. At 91 years young, he lives alone, still drives, has 20/20 vision and is in generally good health. Besides his work with the Virginia state Pearl Harbor Survivor Association, Bill is active with his church and local army base. 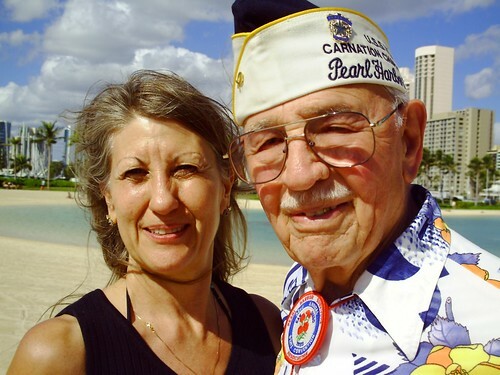 Bill and Joan have nearly a week of organized activities planned for the attending Pearl Harbor Survivors including a boat ride around Pearl Harbor. This will be an emotional time for these veterans. The Pearl Harbor Survivors are getting a hero’s welcome. Joan showed me their schedule for the visit and there is not much free time. Tomorrow they look forward to renting a car and doing some sight-seeing. Bill looks forward to seeing the Pali again. Hawaii has changed in the 60+ years since Bill last saw her. I am interested to know what he thinks of things today. Joan says her father keeps her on her toes. “He calls my voice mail every morning to see if I have updated it to the correct date. Sometimes he catches me,” she smiled. Bill’s only complaint is when he has nothing to keep him busy. He is active on the computer and emails often. He works with local Indians and learned their native crafts. Bill fashions jewelry, spears and other objects. The spear pendant he is was wearing is one of his works. This is a challenge I look forward to. Welcome back, Bill. I am very grateful to have met several Pearl Harbor survivors on my travels to Hawaii. Many of these soldiers toured the Pearl Harbor Visitor Center last year for the final Pearl Harbor Survivors reunion. As they reach their 90’s it is harder for them to travel, especially long distances. Here are the stories of four other Pearl Harbor survivors. We met Pearl Harbor Survivors Association member Stan Reynolds at Duke’s Lagoon in Waikiki Beach, Honolulu, Hawaii. He returned to Hawaii with his daughter for the final Hawaii reunion of the Pearl Harbor Survivors Association (PHSA). I asked Stan about the plans to disband the PHSA group. “We have to. We don’t want to but we have to. There are only 3,000 of us left and we are dropping dead. Two or three a day. It just can’t go on,” he said. 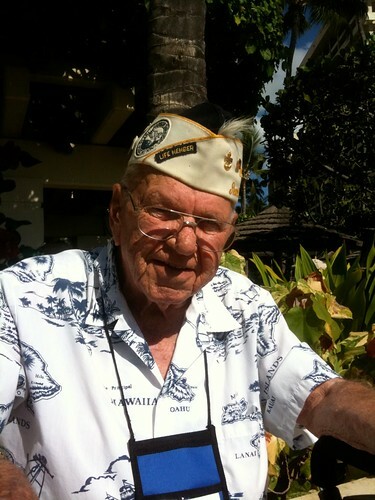 Pearl Harbor survivor Stan Reynolds first came to Hawaii in 1938. He worked in a mine forest, which he described as area infested with land mines. He spoke about his role in a calm manner, though this sounds to me like dangerous work. For 10 years, Stan was a tug boat pilot for the Navy. He was in Pearl Harbor on that fateful morning of December 7, 1941 when bombs showered Pearl Harbor. We met with Stan just after he returned from a preview visit to the Pearl Harbor Visitor Center, which officially opened December 7, 2010. Stan said additional museums are scheduled to open later in the week and the item he donated may be on display in one of these areas. To Stan, our veterans and those currently serving our country, thank you for your service. Reverend Robert Ruffato, survivor of the Pearl Harbor attack, returned to Hawaii for the final Hawaii reunion of the Pearl Harbor Survivors Association. The event coincides with the opening of the new Pearl Harbor Visitors Center. As an 18 year old Navy seaman, he was on the USS Utah when the Japanese began bombing Pearl Harbor. Robert Ruffato is joined by his daughter Bobbie Jean for his third Pearl Harbor Survivors reunion in Hawaii. We talked with them at Duke’s Lagoon in Waikiki Beach, Honolulu, Hawaii. The audio on this video is poor due to high winds so we transcribed the conversation below. We recommend you read the transcription below before you watch the video. I am very grateful to have met several Pearl Harbor survivors on my travels to Hawaii. Many of these soldiers toured the Pearl Harbor Visitor Center last year for the final Pearl Harbor Survivors reunion. As they reach their 90’s it is harder for them to travel, especially long distances. Here are the stories of other Pearl Harbor survivors. I met Ernest “Dave” Davenport, retired with 21 years in the Navy, on a flight to Honolulu, Hawaii. Dave is a survivor of the World War 2 attack on Pearl Harbor December 7, 1941. Although it has been 69 years since that fateful morning, the memory of the Pearl Harbor bombing is still sharp. The first attack surprised everyone. Dave and his fellow seamen quickly ran behind a barrier and started shooting. Dave said they were able to take out one of the planes. “It is important to remember Pearl Harbor and to always be alert. We were not alert on December 7, 1941. We were not alert on 9/11.” Dave told me. As a reminder, he gave me a “Remember Pearl Harbor” lapel pin as part of his personal mission to keep America alert. After his Navy career, Dave returned to Virginia Beach where he taught high school for 17 years. Dave and his wife of 66 years have three sons and two daughters-in-law accompanying them to the reunion to meet with other members of the Pearl Harbor Survivors Association. They will be at the opening of the new Pearl Harbor Visitors Center this week. The new Pearl Harbor Visitor Center in Honolulu, Hawaii at Ford Island is one of several collocated historically significant military sites. The brilliant white Pearl Harbor Memorial rests peacefully in Pearl Harbor above the battle ship U.S.S. Arizona lies at the bottom of Pearl Harbor with many of her crew still entombed. This is where world War ll began for the United States. Standing guard across her stern is the U.S.S. Missouri where the Japanese signed the peace treaty on the deck of the ship. The U.S.S. Oklahoma, Bowfin submarine and Pacific Aviation Museum are also located here. This is the last Hawaiian reunion planned for the Pearl Harbor Survivors Association. Previously, the group met every 5 years at Pearl Harbor. Many survivors are unable to travel due to illness or advanced age. The number of survivors dwindles every year. Born in 1921, Dave was 20 years old on the morning of the Pearl Harbor attack. He is a spry 89 years old today with a twinkle in his eye. Many of the others on duty that morning were older. The Pearl Harbor Survivor Association is chartered by Congress. When the members are gone, the organization will cease to exist. For Dave and other survivors, it is import for us to learn the lessons from the past and do our part to keep our future secure. Learn more about the Pearl Harbor Survivors Association in my interview with Mal Middlesworth, former president of the Pearl Harbor Survivors Association and Herbert Weatherwax, Pearl Harbor Survivor and volunteer at the Pearl Harbor Visitor Center who tells us why he shares his story with future generations. Aloha Dave. Welcome back to Hawaii. We are enjoying our visit to Honolulu on the always beautiful island of Oahu in Hawaii. Yesterday we visited the Pearl Harbor Memorial and met a 92 year old Pearl Harbor survivor of the day which has lived in infamy, Dec. 7, 1941. 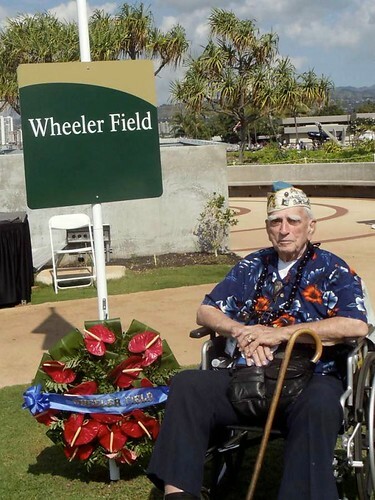 Herb Weatherwax was born in Oahu and was at Pearl Harbor during the attack on Pearl Harbor by the Japanese. Herb later served in the Battle of the Bulge before fighting in Germany. Raised in Hawaii, Herb found the Midwest winters too cold and returned to the Hawaiian Islands after World War II. Herb can be found volunteering at the Pearl Harbor Visitor Center three days a week. He enjoys meeting with and signing autographs for the thousands of visitors he meets each year. Click on the image below to view this episode of “Where Are You Today?” Turn up your speakers and listen as Herbert Weatherwax introduces himself to you. Enjoy this history moment of history.